Many of us know the point where we are running out of space 'cause our collection has grown and we may have more preorders we're waiting for to arrive at our home in the future. Well how creative do you get when you're running out of space but don't want to part with any or just a few of your figures (and more are to be released that will be added to your collection) but you don't have any more space for a detolf etc. in your room and your other detolfs/shelves are already full? What are your creative ideas to make more room for your growing collection? The room over the Bed is most time a wasted space. 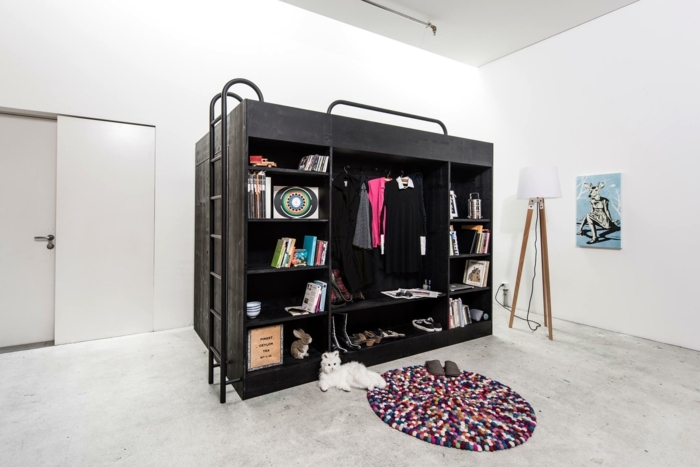 So if you can, make a Loft Bed closet (just enter in google and you'll find a lot of pictures) so you can win a little bit mor space for one or two showcases. Walls, if you have the space and if it can be displayed that way. I have in-box figures hanging on the wall by push pins in between my detolfs or try anything with surface space. Tv stands, fireplace mantle, desk, ontop of the detolf, etc. Those are not allowed either. And no tape of any kind. really lame, I know. Didn't stop me from using a bit of painter's masking tape to hang a poster, but if the landlady needs to come by, hooks and shelves would be harder to take down. Lehst (Il y a 1 an) #26379486x'D yea please help us, right now I have nendoroids in front of my keyboard and on my CHAIR. lol I can't use the computer! x'D ahahahahahhaahha~! I think this to myself everyday! x'D yea please help us, right now I have nendoroids in front of my keyboard and on my CHAIR. lol I can't use the computer! Try optimize the layout of the furniture in my room. Until now that always did the trick and i already found another way to place the next shelf. Switching a closet for a smaller one to add a shelf next to it. Kicking out my desk to create more space. (i never use my floptopper in my room, always downstairs). Saw my bookcase in half so it fits in the lower part of my room. Hanging things to the wall is no option. A small hole always ends up in a big hole because our walls are really fragile. I use to have to have this problem but then I bought another display haha. Recently, I have rearrange my collection and now I have two empty spots in my displays. It's always good to rearrange and rotate some figures around. It keeps your collection fresh and interesting. I haven't got to the point were I've run out of space but if I did, I'd probably put up some more wall shelves or use the guest bedroom.